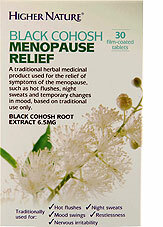 Black Cohosh Menopause Relief works to alleviate symptoms such as hot flushes, night sweats and mood swings. This natural herbal medicine has been adopted across the centuries for its effectiveness in relieving physical and emotional symptoms bought on by the menopause. Formulated using the plant black cohosh, a flower belonging to the buttercup family, we use the whole plant and root to create a powerful supplement that works to reduce feelings of nervous irritability, restlessness and other menopausal symptoms. Not suitable if under 18 years, pregnant, could become pregnant, breastfeeding, or have/have had an oestrogen dependant tumour, or liver or kidney problems. 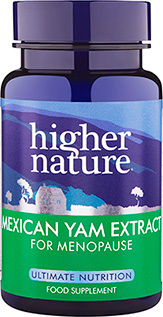 6.5mg Black Cohosh rhizome and root extract (4.5-8.5:1) (equivalent to 29.25-55.25mg Black Cohosh whole rhizome and root). Not suitable if under 18 years, pregnant, could become pregnant (unless contraception is used), breastfeeding, or have/have had an oestrogen dependant tumour, or liver or kidney problems. Within 14 days of taking this product my nightly hot flushes had reduced from 5-6 per night to 1-2. Within 30 days they had stopped completely. I had been waking up burning hot for around 3 months previous to taking this product at least 4 times a night. Although I was not sweating heavily, it broke my sleep. I was drinking huge amounts of water during the day due to an unending thurst causing me to go to the toilet every time I woke with a flush. I also started to experience incredible anxiety - palpitations, restlessness and an inability to switch off my forever churning brain! This product has helped reduce that anxiety a little but I have only been taking it 30 days and I expect it will be more like 3 months before I get a realistic outcome. I can recommend. Most unpleasant are the hot flushes that occur around a woman's menopause and I was experiencing them on an alarmingly frequent basis, day & night for 2 months and I was determined not to tolerate them any longer. I am always reluctant to see my GP and always keen to try gentle but effective alternatives and I have found it in Black Cohosh, thankfully supplied by Higher Nature. Within days there was a 75% improvement and 2 weeks after taking my first tablet I am completely symptom-free! As a Yoga teacher I have to stand by a natural lifestyle to be an authentic practitioner and I would recommend Black Cohosh to anyone with the same symptomatology. 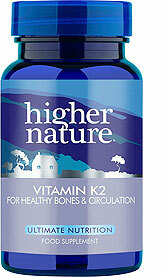 Don't suffer when there is a fabulous natural alternative that works. No more hot flashes for me! this rocks! I had been experiencing an excessive amount of hot flashes, i.e. several per hour, every hour both night and day for about a month or so before I started taking the Black Cohosh. I began to notice something different after about 5 days of taken them and within two weeks I experienced a considerable drop in hot flashes and now, just under a month later they are practically gone. 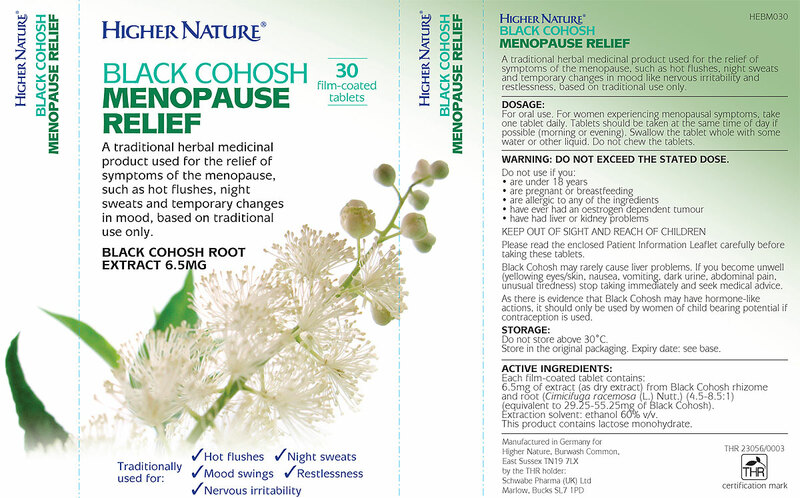 I purchased black cohosh in March 2015, as I'd read that it was good for regulating heavy and frequent periods and I have to say it appears to be working for me after only a very short time. I was getting a period twice a month both lasting 5 days each, it was driving me to dispair and making me feel exhausted. I'm pleased to say since taking this I've managed to go 26 days between my last period which hasn't happened for over 12 months, so really pleased and I would recommend if anyone is suffering from similar problem. I've been experiencing way to many hot flushes during the day and night sweats. The night sweats became manageable when I started taking the supplement and are now (3/4 of a pack in) gone. Hot flushes are much reduced and hopefully will also go away completely. I should add that I also stopped eating/drinking food and drinks with caffeine at the time I started taking the black cohosh supplement. This has not made any difference to me, very disappointed! Especially after reading all the other reviews so I was very positive minded but alas! When she forgets to take them, a bad tempered Gruffalo appears and I place the pills somewhere she can easily find them... Highly recommended btw. This was life changing for me. I suffered from hot flashes, night sweats for six months. Literally after the second day, they all disappeared. I wish I had found out about this wonder pill many months ago. I have been me menaupasal for 5 years. I found Black Cohoch two years ago...it gave my life a different prespective. The hot flashes mood swings, tiredness, irritability have gone. My children love it to... as they got a happier mum! For me Black Cohosh has relieved hot flushes, I still have some mild night sweats, but best of all, when I have my period, although sore on day 1 and 2 I can still manage to function, something that was becoming increasingly hard to do!